Have you heard of muscle wire? It contracts when you pass current through it, heating it up, and returns to its original length when it cools. 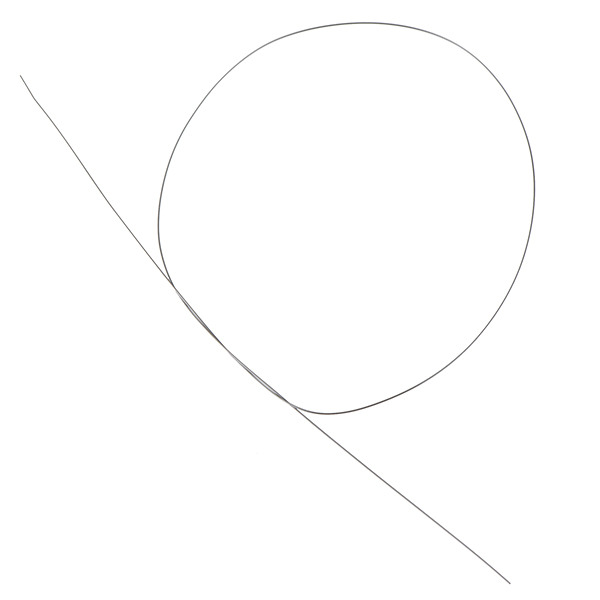 It's made of shape memory alloy called Nitinol which undergoes a "reversible solid-state phase transformation known as a martensitic transformation" [Source: Wikipedia]. Have you used it? Post up your projects in the comments. Here's the 2013 Robotic Christmas video from the Autonomous Systems Lab. Enjoy! Previously we looked at an option of lifting the trash can and driving it down the driveway to the curb. This time around let's look at the other option of grabbing the can's handle and wheeling it to its destination. The robot can either tilt the can and roll it like I do or drag it flat. Again, one robot. Stock (or slightly modified) can. Less force is required to tilt the can than lift it as you might intuitively guess. Probably a good idea to do some preliminary calculations on this tilty thing. The force required to tilt the 25kg can around its wheel axles measures 45-50N. About 45-50N is required to tilt the can at its handle. If you use some kind of arm to do this tilting, how much torque is needed? 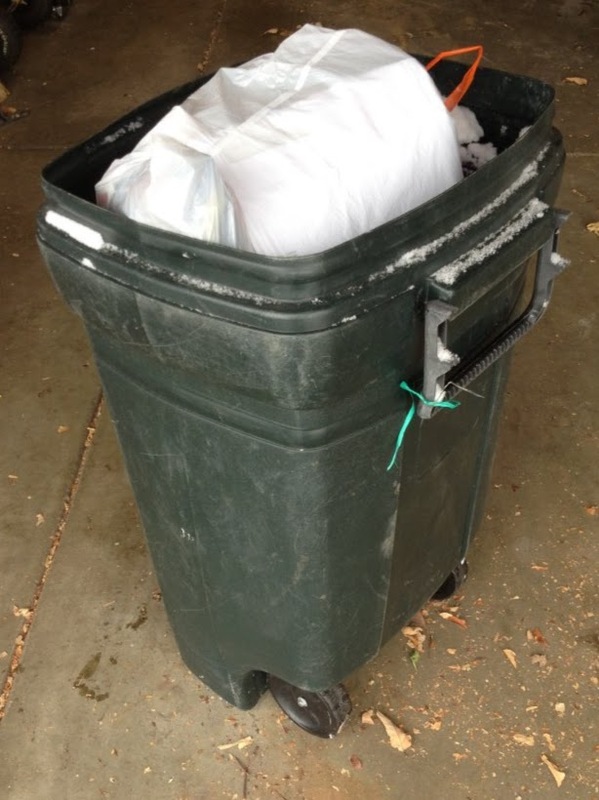 My trash robot, TOTT Bot, is going to take the trash to the curb for me. I have a clearer picture of the problem from last time. Time to think about some designs. This is the fun part. Here's what I came up with. Chime in if you have other ideas. After thinking about zany ideas it's time to be the dark-suit-wearing buzzkill. Frown and look stern. It helps get you in character. The first two options are out. Why? I don't want to add extra weight to cans that the trash carriers must deal with and I only want one robot. Let's talk about lifting the can and driving it to the curb first. Some potential difficulties may arise designing for the weight of the cans, their center of mass being so high, the inclined path, among other things. Only one robot required. The chassis will have to be able to hold a full 50lbs (20-25kg). And something will have to lift that weight up a short distance off the ground. This might work, but we probably should do some quick calculations. So, first of all, how much torque is required to move a 25kg (+5kg robot?) on an inclined driveway? Same answer whether I'm lifting or rolling the can, by the way. And the answer depends on the wheels and gearing and on how much acceleration you want. Actobotics has a 6" heavy duty wheel and a variety of precision gear motors. You may know that torque is equal to force at a specified distance (wheel radius). And force is equal to mass times acceleration. I'm using SI units like all the cool kids. Mass is 30kg. Wheel diameter is 0.1524m (6") and the torque acts at the radius. 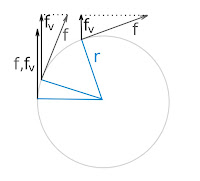 Here's a diagram from Wikipedia showing the forces involved in a free body on an inclined plane. Gravity, g, is 9.81 m/s2 and the angle is up to 8 degrees. If we were climbing the hill, the geartrain and motor need to generate a force equal to f to stay still (zero acceleration), greater than f to achieve any acceleration uphill, and less than f to accelerate downhill. So how big is f? We're talking about 41 Newtons (kg-m/s2) to stay still. I have no concept of 41N because I live in America but no matter, let's just figure out motor torque. For a 0.1524m (6") diameter wheel, the torque generated by the motor and geartrain at the wheel radius must exceed 3.12N-m. (If the wheel radius was 1m then the torque required would be 41N-m). It's possible that if the motor is in braking mode, with the torque multiplication of the geartrain it'll be ok. I'll have to verify that later. How much force is required to lift the can vertically? The force would have to exceed the can's mass times the acceleration due to gravity, mg or 9.81m/s2 times 25kg which is about 245N. Let's suppose you use a motor or servo with an arm to somehow lift the can. Or a winch with a drum. 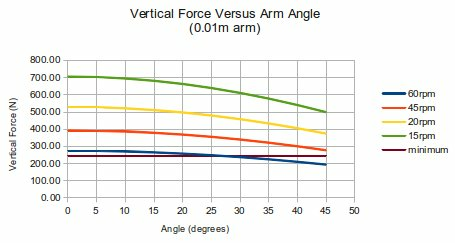 If the arm/drum has a 0.01m (4") length/radius, the force at that distance is 245N so the motor driving it needs to supply at least 0.01 times that, or 2.45N-m of torque. Two motors halve that requirement. The shorter the arm, the less motor torque required but also the less movement possible. ServoCity offers a selection of precision gear motors that look like possible candidates for driving such an arm. There are also hi-torque, geared servos available. The 45rpm gear motor supplies a torque of 1.963N-m. Two of them give 3.93N-m which should be adequate for a 0.01m arm. 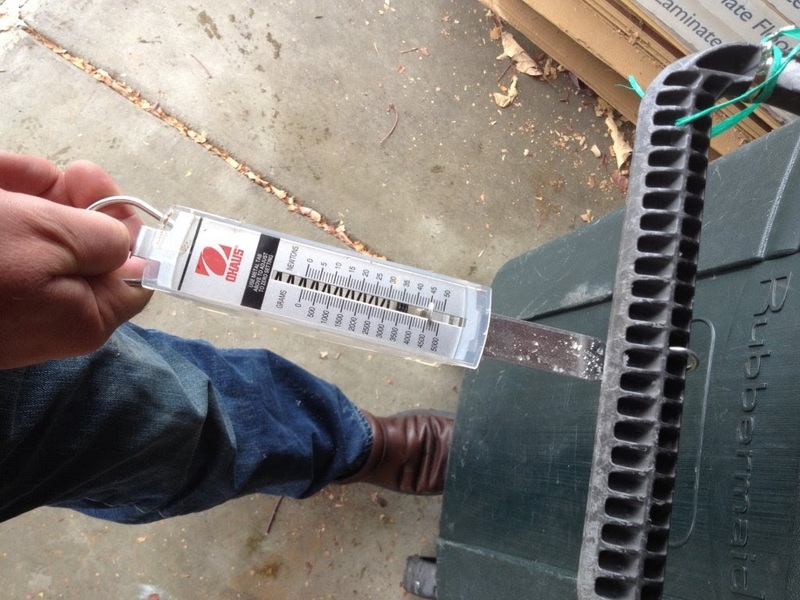 There's also a 20rpm model as well as lower and higher geared models. ServoCity also offers some killer geared servos. The one pictured above puts out 1281 oz-in of torque when geared 7:1, or over 9N-m. Just one of these servos should be more than enough to lift 50lbs with a 0.01m arm. Something else to consider is that the torque required is at a minimum when the force is perpendicular to the Earth's surface. 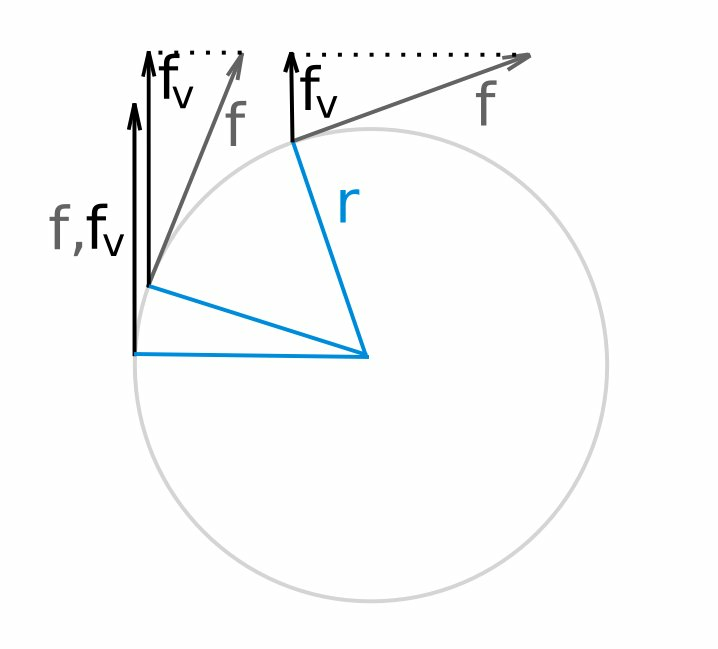 Using a rotating arm, the force will be applied at increasing angles to the force of gravity (see picture). The vertical component will diminish to zero as the arm reaches vertical. Therefore, it'll be best to operate the arm in a narrow range of angles. Below is a plot of available torque for several motors, given a 0.01m arm, at different angles. Here's a plot of 0.01m arm angle versus vertical force. The 60rpm motor can operate up to 30 degrees. Any of the lower-geared motors can run up to 45 degrees, no problem. Ok, that design could work. I still want to double-check the lifting capacity of these motors and servos in the real world in case I goofed up something.